Die Sabbati, 29 Februarii, 1667. Privilege.- Petition from persons in custody. Motion deferring the attendance of a person. ORDERED, That to prevent any Surprize in the electing a Knight for the County of Hartford, Mr. Speaker do forbear to sign the Warrant for the Election of a Knight for that County till Thursday next. Mr. Ratcliffe delivers in a Bill, prepared by the Committee appointed for that purpose, to prevent Abuses in the Post Office. A Petition of Toby Humphreys, Richard Pritchard, Wm. Moody, Tho. Driver, and Wm. Robinson, now Prisoners in the Custody of the Serjeant at Arms, was read: But the Abuse and Misdemeanour by them committed being very great and oppressive to the Country; and their Petition was not submissive, in acknowledging the Matter of Fact and Offence; nor offering Satisfaction to the Persons injured; the House rejected the Petition. Ordered, That Mr. Steward's Report be made on Monday Morning. An additional Bill to prevent Abuses arising by the Duty of Hearth Money, in collecting thereof, was read the Second time. Resolved, That the Bill be committed to the same Committee, which was formerly appointed to prepare and bring in the Bill: And that the Committee be revived, and do sit this Afternoon in the Place formerly appointed; and to peruse, and take into Consideration, the Three former Acts made concerning this Duty, and such Proposals as shall be made for the more easy and effectual collecting of it: And Sir Robert Atkins, Sir Cha. Harbord, Sir Wm. Lowther, Mr. Vaughan, Col. Birch, Sir Walter Young, Mr. Whorewood, Sir Tho. Clergis, Sir Tho. Higgons, Mr. Wm. Harbord, Mr. Pepys, Mr. Ratcliffe, Sir Robert Carre, Sir Solomon Swale, Sir Wm. Lewis, Mr. Crouch, Sir Charles Wheeler, Mr. Buscowen, Sir Wm. Strode, Sir Antho. Irby, Mr. Prynn, Sir Jo. Moreton, are added to the Committee: And all that come are to have Voices. Sir Robert Carr, for the Yeas, 78. Sir Nicho. Carew, for the Noes, 96. Ordered, That Mr. Walden have the Leave of this House to go into the Country to attend the Assizes. The House then Resolved into a Committee of the whole House, in order to the Consideration of the Motion made, for a Supply for the King's Majesty. Mr. Seymour took the Chair of the Committee. Mr. Seymour reports from the Committee of the whole House, as to the Manner of raising the Supply for his Majesty; and humbly moved from the said Committee, that the House would nominate a Committee, to consider what Foreign Commodities are fit to receive an additional Duty; and to estimate what the same may raise yearly; and to inspect the Custom House Books for the same Purpose; and to report the same to the House: And that the House would resolve into a Committee again, on Friday Morning next, to proceed in the Matter of his Majesty's Supply. 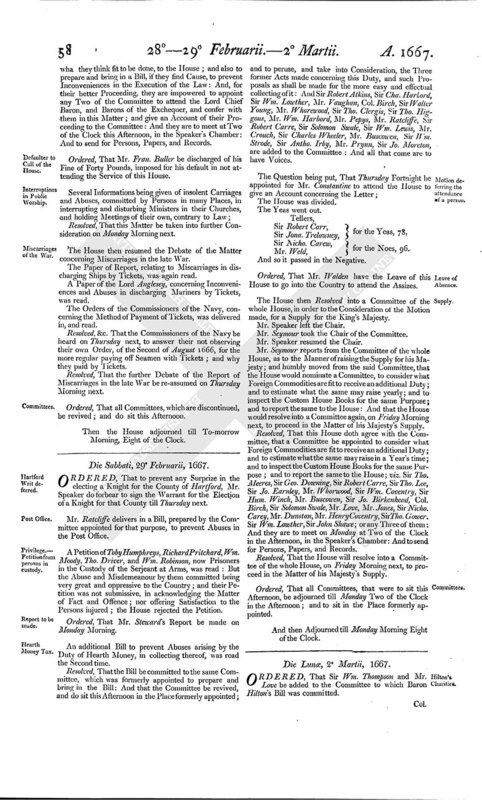 Resolved, That this House doth agree with the Committee, that a Committee be appointed to consider what Foreign Commodities are fit to receive an additional Duty; and to estimate what the same may raise in a Year's time; and to inspect the Custom House Books for the same Purpose; and to report the same to the House; viz. Sir Tho. Meeres, Sir Geo. Downing, Sir Robert Carre, Sir Tho. Lee, Sir Jo. Earnely, Mr. Whorwood, Sir Wm. Coventry, Sir Hum. Winch, Mr. Buscowen, Sir Jo. Birkenhead, Col. Birch, Sir Solomon Swale, Mr. Love, Mr. Jones, Sir Nicho. Carey, Mr. Dunstan, Mr. Henry Coventry, Sir Tho. Gower. Sir Wm. Lowther, Sir John Shawe; or any Three of them: And they are to meet on Monday at Two of the Clock in the Afternoon, in the Speaker's Chamber: And to send for Persons, Papers, and Records. Resolved, That the House will resolve into a Committee of the whole House, on Friday Morning next, to proceed in the Matter of his Majesty's Supply. Ordered, That all Committees, that were to sit this Afternoon, be adjourned till Monday Two of the Clock in the Afternoon; and to sit in the Place formerly appointed. And then Adjourned till Monday Morning Eight of the Clock.